The hilly terrain turns what would otherwise be a nondescript perpetual care cemetery into a beautiful, peaceful memorial park. From the tallest hill, surrounded by headstones and hundreds of the flat, metal, lawnmower-friendly markers that have become dominant in modern cemeteries, you can see busy South Cobb Drive below, and Georgia Power’s huge Plant Atkinson to the immediate south. What you can’t see is the Chattahoochee River, only a five-minute walk away. Despite the official name of the cemetery, Riverview Memorial Garden, the river is obscured by both the power plant and the highway. 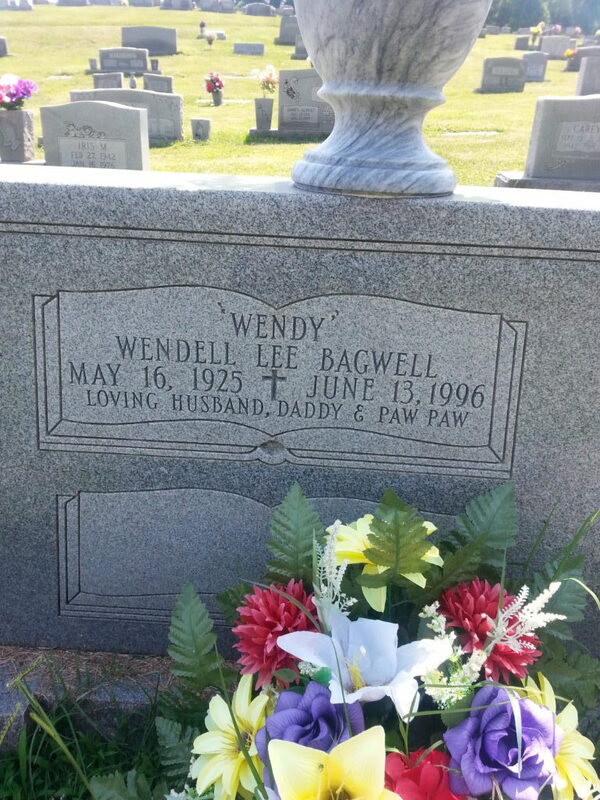 The cemetery’s most famous resident by far is Wendell “Wendy” Bagwell, a gospel singer and comedian, whose best-known comic narrative was about a performance of his trio at what turned out to be a Pentecostal snake-handling ceremony. After serving in the Marines during WWII, he went into the furniture business with a store on South Cobb Drive. The timing of his grand opening was unfortunate in one respect, because his building was near the river encampment and hideout of the notorious Bagby brothers, who specialized in burglary and larceny. Wendy Bagwell, the daughter of the elder “Wendy”, wrote in a facebook post that their family store was a frequent target of the Bagby brothers’ break-ins. In one of the ironies common in cemeteries, where people who are adversaries in life often rest alongside each other in death, the brothers are now all buried near Bagwell. The Bagbys had colorful nicknames like “Roosterman”, “Buggerman”, and “the Ghost.” If they had been an average group of burglars, they would have been no more notable than thousands of other gangs that have operated in the Atlanta area over the decades. But they became famous among reporters and local law enforcement for spectacular escapes from custody. They hid by the Chattahoochee, and eluded capture with a skill that many considered nearly superhuman. 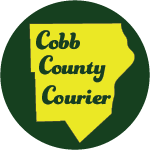 Between 1945 and 1968 there were more than 20 articles in the Atlanta Constitution about the Bagby brothers. Richard Bridges, a nephew of the Bagby brothers said “Uncle Grady was the most athletic man I’ve ever known.” He also said his grandfather, and Roosterman’s father, Hunter Bagby, “had his hands full” raising a large family while working at nearby Whittier textile mill. Life in mill housing was rough, and often produced rough young men. Grady and Hubert escaped from custody, and from police pursuit, many times by using their intimate knowledge of the river and the woods close to the water. Now they are buried near the banks of the Chattahoochee. 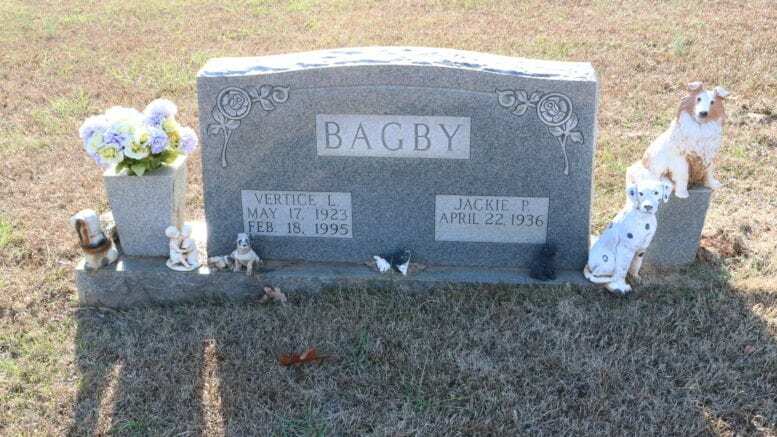 Grady “Roosterman” Bagby was killed while fighting his brother Vertice in 1968, and Hubert “the Ghost” died in 2014, his headstone decorated with an Atlanta Braves logo and a statue of a beagle. 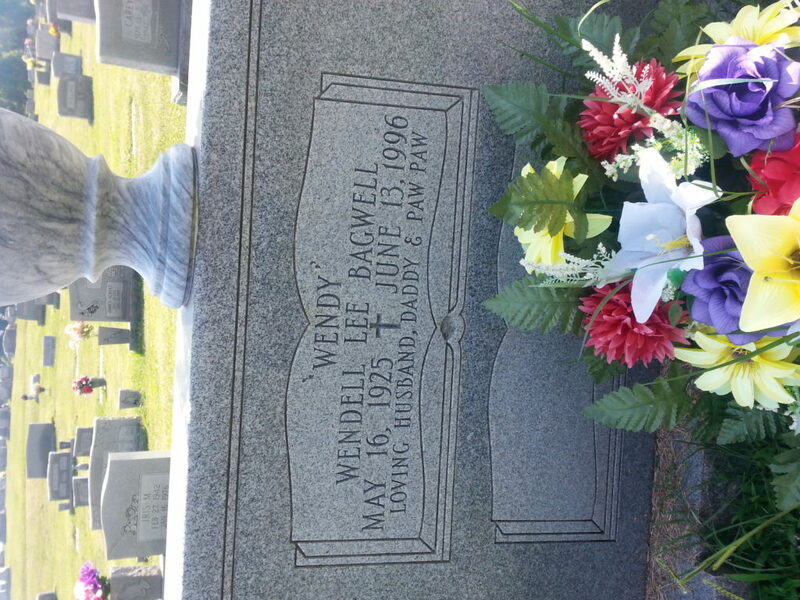 Wendy Bagwell’s grave is just to the east of the cemetery’s sexton cottage, and the Bagbys are buried nearby in an adjacent row. For a glimpse of even earlier history, you can walk from Bagwell’s grave, eastward and uphill, to the woods bordering Plant Atkinson, where you’ll encounter a rough wooden archway inscribed “Hooper McWilliams Cemetery.” A 19th century family cemetery, it has about two dozen graves, most of them marked only by plain, uninscribed river stones. This cemetery is not owned by Riverview Memorial Garden, and predates the larger adjacent cemetery by a century. Roberta Cook is founder and president of the River Line Historic Area, a local group dedicated to the preservation of historic sites along Johnston’s River Line, named for the Civil War general who built a series of fortifications along the Cobb County side of the river. RLHA maintains the tiny historic gravesite with the help of volunteers. “The cemetery was on the property of Thomas Hooper, one of the earliest white settlers to the area,” she said. She explained that Hooper was a prominent landowner on the River Line, and that his house was very close to his burial site. 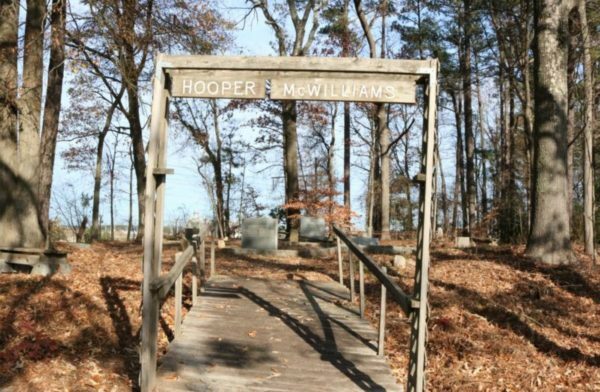 The earliest known burial in Hooper-McWilliams was that of Christian Hooper, who died as an infant in 1836. The patriarch of the family, Thomas Hooper, was buried there in 1879. The most recent interment at the site was of William B. Miller in 1985. Riverview Memorial Garden and the Hooper-McWilliams cemetery are located at 5411 South Cobb Drive, Smyrna, Georgia, just south of I-285, and north of the Chattahoochee River. Be the first to comment on "Bandits, Pioneers, and a Comedian: a visit to Riverview Memorial Garden"